Dickson Industries has built its reputation for more than 30 years on designing and building innovative machines that rip up old roads in preparation for a newer, better surface. The Road Pro 4170HDC carries on that tradition. This multipurpose machine was designed from scratch by Dickson engineers. Our team worked closely with Dickson during the design phase in determining that the newest Road Pro would be powered by a Perkins 4.4-liter, turbocharged and air cooled 4-cylinder engine. The compact size of the Perkins engine and the elimination of a PTO drive, in favor of a hydraulic version, allowed Dickson engineers to develop a compact machine with greater maneuverability. The flexibility in how the Perkins engine can be installed allowed Dickson’s engineers to rotate the 170 hp Tier 4 diesel engine 90 degrees in the body of the machine. This gave them the ability to build a narrower body and shortened wheelbase. Those dimensions allow the Road Pro to operate in tight spaces and to reach the toughest areas on a surface. Protecting the engine is an oversized air cleaner with safety filter, a self-cleaning pre-cleaner that removes dust before it enters the main air cleaner, and a zinc plated rain cap. It is also equipped with an engine shutdown that guards against high temperatures or low oil. Dickson considers the addition of the hydraulic tool drive to be the biggest change in this version of the Road Pro. By replacing the PTO drive and shafts, the machine can be fitted with a greater number of tools. 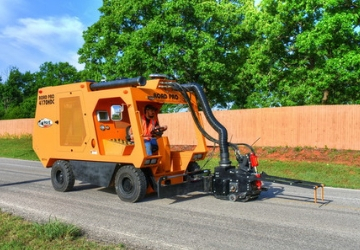 Grinders, polishers, saws, shot blasters and brushes are just a few of the implements that can be mounted at the front of the Road Pro. The Perkins engine is driving an American-made axial piston that has 100 cc displacement per revolution and creates 5800 psi maximum working pressure. The single-piece rigid housing reduces leak paths and its low noise design improves operator comfort. Dickson’s extensive customer base that adds the Road Pro 4170HDC to its equipment fleet will benefit from our equally extensive dealer network. We offer a rigorous program that keeps technicians at our dealers updated on the latest Perkins factory training. This ensures that wherever Road Pro operators are, the maximum uptime from their machines can be achieved.